On the occasion of the Battle of Britain’s 75th Anniversary, the number of veterans who saw action or took part in that epic battle has sadly dwindled. However, for collectors and lovers of aviation, a small number of these legendary veterans came together for the Military Gallery to personally autograph this new commemorative edition. As the Publisher celebrates its own 40th Anniversary, they have been deeply honoured over the years to share the company of many of these heroic airmen and we are sure that this release will help continue a lasting legacy of 'Britain's Finest Hour' for future generations. They came from every corner of Britain. And mostly they were young. These fresh faced fighter pilots, joined by an ever-growing band of volunteer airmen from the British Commonwealth and those who had managed to escape from the occupied countries of Europe would, over the summer of 1940, not only hold the world’s most powerful air force at bay, they would defeat it. Air Chief Marshal Sir Hugh Dowding, head of Fighter Command, called them his ‘fighter boys’ but it was Prime Minister Winston Churchill who gave them the name that’s forever etched into the history books – 'the Few'. In a rousing speech before a packed House of Commons on 20 August 1940 he expressed the world’s gratitude to these brave, heroic airmen who ‘undaunted by odds....are turning the tide of the world war by their prowess and by their devotion. Never in the field of human conflict was so much owed by so many to so few’. Richard Taylor’s stunning piece graphically conveys the conflicting realities of those deadly aerial encounters over southern England during 1940. As the sound of Merlin engines briefly interrupts the tranquillity of a sleepy English village, its residents are determined to carry on with everyday life. 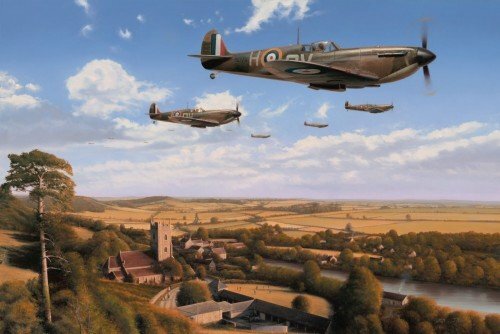 In the skies overhead the bitter battle will shortly be reaching its crescendo but, for today at least, the fighting is over as Flight Sergeant George ‘Grumpy’ Unwin, one of the Battle of Britain’s top Aces, and the Spitfire pilots of 19 Squadron return from yet another encounter with Goering’s much-vaunted Luftwaffe.